What Are The Best Online Bachelor's in Economics Programs? What Else Can I Expect From an Online Bachelor's in Economics Program? An online bachelor's degree in economics puts you at the forefront of today's global economy. As a student, you will learn advanced principles of supply and demand and how they function in a complex marketplace. This knowledge, in turn, helps businesses understand consumer choices and improve their bottom line. Because graduates from online bachelor of economics programs study the nuances behind company and consumer decision making, they acquire skills that are essential to any organization or business enterprise. Graduates can go on to become economists, financial analysts, personal financial advisors, and statisticians — professions that are all projected to grow over the next six years, according to the U.S. Bureau of Labor Statistics. The National Association of Colleges and Employers also shows that professionals with bachelor's degrees in economics exceeded the average starting salary for most professions. Choosing the right program will depend on a student's unique interests and circumstances. In the first place, it is important to distinguish between a bachelor of arts in economics and a bachelor of science, and which programs offer one or both degrees. A bachelor of science degree in economics has a heavy quantitative emphasis, digging deeply into the math and statistics that underpin economic behavior. A bachelor of arts will focus more on qualitative analysis of broader economic, behavioral, and social phenomena. On top of general education courses, programs usually require students to take a sequence of core economics courses in subjects such as microeconomics, macroeconomics, statistics, and finance. Students can also customize their degree through a choice of subfields like accounting, business, or public affairs, and by selecting any number of upper-division and elective courses including econometrics, political economy, and economic history. Much will depend, though, on the unique requirements of each online program. Students may need to strike the right balance between core classes and program-specific classes. Some programs are also more generous with transfer credits than others, and program cost is always a cardinal consideration for prospective students. In addition, many colleges charge different tuition rates for residents and nonresidents for both online and on-campus classes. CSU is a public research university that was founded in 1870 in Fort Collins, Colorado. The school offers a bachelor's of arts in economics that teaches students how to interpret data, policies, and research and prepares them for careers in government, banking, real estate, or consulting. The curriculum includes courses on a variety of topics, such as micro- and macroeconomics, econometrics, gender and economy, and money and banking. Applicants to this online bachelor's degree program in economics must transfer college credits into the program, which makes it ideal for continuing education students who have completed an associate degree or previous college coursework with a minimum 2.0 GPA. A minor is also required for degree completion, with options such as business administration, sociology, anthropology, gerontology, media studies, and political studies. CSU is accredited by the Higher Learning Commission. OSU offers a bachelor's of economics program which has three different tracks: general training in modern economics, managerial economics, or law, economics, and policy. Regardless of the track chosen, students will develop the necessary skills to pursue careers as a financial analyst, management consultant, or investment banker. The curriculum includes courses on a variety of topics, such as micro- and macroeconomics, econometrics, public policy analysis, and differential calculus. Distance learners at OSU have access to a variety of support services, including online tutoring, library book delivery and databases, and a success counseling service that helps students evaluate and identify strategies to support their academic success. All online students pay the same tuition rate, regardless of residency. OSU is accredited by the Northwest Commission on Colleges and Universities. Penn State has offered online degrees for more than a decade through the school's World Campus. The school offers a bachelor's of science degree in economics that is ideal for passionate students with a strong background in analytics or programming and are capable of understanding and describing situations through numerical data. Graduates are prepared to pursue careers as financial examiners, market research analysts, statisticians, financial advisers, and more. The curriculum emphasizes mathematics and statistics and includes courses on a variety of topics, such as micro- and macroeconomics, econometrics, money and banking, computer programming, and calculus and statistical analysis. World Campus students have access to online new student orientations, academic advising, career counseling, and a nationally-recognized research library. Penn State is accredited by the Middle States Commission on Higher Education. Liberty is a private nonprofit Christian university that was founded in 1971 in Lynchburg, Virginia. It is the largest Christian university in the world and currently serves over 100,000 students each year. Liberty offers a bachelor's of science in economics with an emphasis in business administration. This program teaches students business fundamentals while also developing the skills in micro- and macroeconomics that are required to enter the domestic or international marketplace upon graduation. The curriculum includes courses on a variety of topics, such as managerial accounting, corporate finance, organizational ethics, international business, and business law. Liberty allows students to earn additional credits through its Experience Plus Program. These credits can be earned through prior education, professional training, job experience, military training, and more. Liberty is accredited by the Southern Association of Colleges and Schools Commission on Colleges. WSU offers an online bachelor’s degree in economics that emphasizes economics within the context of the business world. Students must choose between two concentrations in either management or commodity marketing. The program teaches students how to evaluate and apply quantitative concepts and methods and how to clearly communicate their findings. Graduates of WSU economics programs commonly pursue careers as statisticians, data analysts, and loan officers, or continue their studies in graduate school. The curriculum includes courses on a variety of topics, such as micro- and macroeconomics, econometrics, labor economics, and industrial organization. Online students are encouraged to participate in the Common Reading program, which cultivates academic discussions and learning opportunities as they progress through a selected book. Distance learners have access to a variety of resources, including career services and academic support. WSU is accredited by the Northwest Commission on Colleges and Universities. Utah State offers two options for students interested in pursuing an online bachelor's degree in economics: a bachelor's of science and a bachelor's of arts. The programs offer four optional areas of emphasis: economic theory, managerial economics, pre-law economics, and international economics and trade. Each plan consists of the same core coursework, with the bachelor's of arts degree also requiring a foreign language component. The program provides students with a strong foundation in economic theory and analysis of production, distribution, and consumption of goods and services. Distance learners have access to a variety of student services, including counseling and online academic support. All programs at Utah State are designed for undergraduate students who have a minimum GPA of 3.5, regardless of whether they are freshman, transfer students, or adult learners. Utah State is accredited by the Northwest Commission on Colleges and Universities. UWG’s bachelor of business administration with a major in economics prepares graduates with analytical and communication skills essential for careers in business or public service. Students complete the 120-credit, four-year program in a hybrid format; approximately 60% of instruction occurs online, while the remaining 40% requires multiple visits to the university’s Carrollton, GA campus. The curriculum explores topics in accounting, marketing, and management. It also features core courses and major-related and non-major electives. Prospective students must have earned a high school diploma or GED and submit official transcripts along with their application form. Transcripts should indicate the completion of four years of math, science, and English, along with three years of social science and two years of foreign language. ACT or SAT scores are also required. Georgia residents pay discounted tuition for in-person classes. FHSU offers more than 50 online degree that are specifically designed for adult learners, including a bachelor's of business administration in international business and economics. As the global economy continues to become more and more dependent on international trade, an online bachelor's in economics will become even more useful. The comprehensive curriculum offers students a broad base of knowledge through traditional business courses, supplemented with study in political science, sociology, geography, and foreign language. These courses teach students how to develop their analytical skills, cultural sensitivity, and knowledge of the global economy and international trade environment. Distance learners at FHSU have access to online finance journals, internship opportunities, and scholarships. Graduates with a bachelor's degree in economics are prepared to pursue positions in government agencies, nonprofit organizations, and world-class organizations. FHSU is accredited by the Higher Learning Commission. 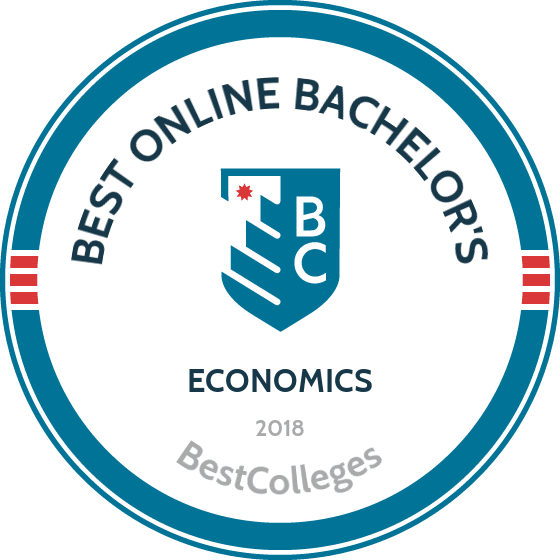 Texas State University offers two online economics degrees, the bachelor of arts in economics and bachelor of business administration in economics. Although both degree programs prepare graduates for careers in business, the bachelor of business administration features a core curriculum that develops specialized knowledge. Conversely, the bachelor of arts program provides students with greater flexibility to choose courses related to their professional interests. This degree path also prepares graduates for careers in government. Applicants must possess a high school diploma or its equivalent, and submit official transcripts or GED score reports. ACT or SAT scores are required as well. Transfer applicants with less than 30 college credits must also submit high school transcripts and standardized test scores. The university receives regional accreditation from the Commission on Colleges of the Southern Association of Colleges and Schools. RMU is one of only 5% of global business schools with accreditation from the Association to Advance Collegiate Schools of Business, making it an attractive option for students interested in an economics degree. The School of Business at RMU offers a bachelor's of science in business administration with an added concentration in economics. This online bachelor’s degree with an economics concentration prepares students to pursue careers in business, industry banking, and government, or to continue their education in graduate school. The 120-credit program features five components, including core classes, business foundations courses, economics courses, and electives both within and outside of the School of Business. Distance learners at RMU are paired with an online student services representative during admissions. These professionals act as a mentor and guide for their students throughout the program. RMU is accredited by the Higher Learning Commission. Every economics program is unique, though most share a few common characteristics. The field of economics is broad and intersects with a number of interrelated disciplines. Some economics programs emphasize the business dimension of the field, while others treat economics as a social science. Prospective students will need to carefully evaluate these differences when selecting a program. Course names, objectives, and learning outcomes may differ by school, but in general, schools offer a common set of courses that introduce students to economics in its many facets. Below, we've highlighted a few courses you'll see in most economics programs. Introduction to Econometrics: Econometrics is a discipline that uses statistics and mathematics to illustrate economic principles. This class will help students extract simple relationships between different datasets while also using this data to solve common economic dilemmas. Distance learners who plan to pursue careers as financial advisors and examiners will benefit greatly from this course. Principles of Macroeconomics: Macroeconomics is a branch of economics that seeks to define the structure and behavior of economies as a whole, rather than individual behaviors within these economies. Among other areas, students explore fiscal policy and how it affects national unemployment and inflation rates. They will also develop theory-based tools to help them explain GDP, national income, and price indices. Labor Economics: In this class, online bachelor's degree in economics students learn how labor relations, wages, and government policies affect the workforce. In addition to studying present and future employment and wage trends, students learn about the influence of labor unions and the reasons behind their creation. This course would be ideal for those seeking careers as market research analysts. HOW LONG DOES IT TAKE TO GET AN ONLINE BACHELOR'S IN ECONOMICS? A student's enrollment status and a school's credit hour requirements will directly affect the length of an online bachelor's degree in economics. Enrollment status is up to individual students, but full-time enrollment will enable you to complete your degree in less time. Most programs expect you to be enrolled in at least two to three courses per semester to be considered part-time. Another factor affecting program length is that some students have the option to take courses asynchronously — at their own pace — while others take online classes as a cohort, synchronizing their schedules with prescribed class times. In order to graduate, schools require students to complete around 120 credit hours taken over the course of four years, but transfer credits may reduce the time it takes to get the degree. Regional accreditation is the most popular and widely-recognized form of accreditation among the many public and private higher learning institutions in the United States. Regional accreditation agencies exist throughout the country and are tasked with monitoring the academic standards of individual programs. The Council for Higher Education Accreditation (CHEA) oversees the six U.S. regional accreditation agencies. An example of a regional accreditation agency is the Middle States Association of Colleges and Schools which oversees institutions in the midwest. The U.S. Department of Education (DOE) works with CHEA to ensure the accreditation process runs smoothly between agencies and academic institutions. National accreditation is handled by CHEA-supervised agencies. Specialized accreditation also exists and is reserved for programs in a particular field. An example is the Association to Advance Collegiate Schools of Business, which grants accreditation to business schools that provide an excellent standard of education in traditional business subjects like economics. Overall, accreditation is an important consideration in determining the quality of online economics programs, and prospective students should ensure the programs they are considering are either nationally or regionally accredited. A list of regionally and nationally accredited schools can be found on the DOE and CHEA websites. A bachelor's degree in economics is a prerequisite for many professions in business, economics, and financial analysis. Graduates of economics programs might forecast market trends or analyze consumer behaviors to optimize a company's strategic decision making. They must also be capable of evaluating and communicating the results of economic analyses to stakeholders, which is why a well-rounded baccalaureate education is a must for most employers. Salaries vary, but many economics graduates go on to take high-paying positions in the public and private sectors. Once you earn an online bachelor's of science degree in economics, your salary is determined largely by the type of job and level of experience. Entry-level employees with economics degrees can make in the range of $50,000 to $66,000 a year, and experienced professionals can earn upwards of $69,000 to $132,000 a year. Below is a list of common career paths for economics graduates. The overall median salaries are calculated along with typical salaries as individuals progress through their careers. A bachelor's of economics degree prepares graduates for a wide range of job opportunities. Graduates can work in the public sector or private sector, while some go on to pursue more specialized research roles in academia. In the business sphere, economics graduates will be able to predict and assess the financial performance of companies. Economists and financial analysts can also forecast patterns such as recessions and rates of inflation, and are integral to the understanding of job markets, job growth, and productivity. Examiners oversee company tax records, loan documents, and other materials to ensure businesses are adhering to federal rules and regulations. They also assist companies with corrective actions when they find violations. Statisticians utilize theories of applied science to analyze data and use these results to give advice to their clients. They also manage and execute surveys to ensure data accurately reflects the current business climate. A financial analyst oversees company investments, stocks, and bonds. They also help companies understand their investment portfolio and its viability in the current marketplace. A financial advisor works at banks, investment firms, and insurance companies to help clients plan and navigate their financial future. They explain tax laws, help clients identify good investment opportunities, and assist with insurance issues. Analysts review data gathered through interviews and surveys to improve company profit margins. They also collect data on competitors to determine the best prices and methods for product distribution. Professional organizations provide a network for working professionals to connect with thought-leaders all over the world who work in their field. Organizations schedule conferences that give members the opportunity to meet peers and sharpen their skills. They also provide resources like exclusive job listings and educational materials. Economics majors can join these professional organizations while they are still students, or after college. These organizations also make great additions to resumes and social media profiles. Founded in 1885, AEA is dedicated to the publication and discussion of economic research. AEA hosts an annual meeting, provides career resources, and publishes scholarly journals and articles written by members. NABE was created for professionals who use economics in the workplace. The organization also holds events, conducts exclusive courses for members, and has a number of chapters and roundtables that are hosted around the country. The ASE was created in 1941 to conduct research in social economics. They publish papers, host several regional conferences, and provide awards and grants for researchers in the area of social economics. Before you decide to pursue a bachelor's degree of economics, you should be aware of the many resources that can help finance your education, including the Federal Application for Student Aid (FAFSA) that schools require prior to enrollment. The FAFSA looks at a student's financial status to determine if they qualify for federal loans, grants, and scholarships. There are also exclusive private scholarships available for economic majors such as the Enid Hall Griswold Memorial Scholarship, the Daniel M. Bylander Economics Scholarship, the Dr. Harvey Paul Scholarship for Economics, and the Barbara Miller Memorial Scholarships.